Students learn about the study the effects and efficacy of six commercial antibiotics on bacteria. Observing the effects of six different antibiotics on gram-negative and gram-positive bacteria gives students a clearer understanding of how antibiotics fight off infection. The commercial antibiotics included are chloromycetin, erythromycin, novobiocin, penicillin G, streptomycin, and tetracycline. The kit includes tube cultures of Bacillus subtilis, Escherichia coli, and instructions. Ordering information: This item contains a coupon for live or perishable materials. You need to provide a date that the live or perishable components will arrive. 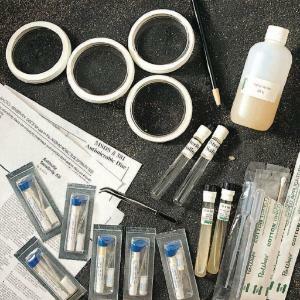 All microbial cultures undergo an extensive quality control program prior to releasing for sale, so they are guaranteed for purity as well as for species. Ward’s Science is not affiliated with the American Type Culture Collection and does not provide ATCC numbers for our organisms. Microbial and fungal cultures are restricted and can be ordered only by educational professionals. Delivery information: The kit ships separately from the live component. Kits do not contain perishable components and generally ship via UPS ground. Perishable components will ship via overnight or second day delivery. Caution: Caution Information: While the organisms in this activity are non-pathogenic, Ward’s recommends that you utilize proper aseptic technique when handling all microorganisms.